Articles Archives - Make Coffee You Love! Discover the latest coffee trends or how to make coffee you love with helpful tips and tricks. If you've been keeping up on the world of Press coffee you'll know that the AeroPress continues to grow as a beloved brewing device. Here at Seattle Coffee Gear we love it, and we're sure you will too once you get your hands on it! If you haven't seen this wonderful brewer, check it out here. Once you've done that, or if you're already an AeroPress user, read on for some tips and tricks! One simple way to get better flavor out of your AeroPress is simply through blooming the coffee. This is a technique used primarily in drip brewing, and especially in pourover. The bloom is simply a small pour before your main pour to wet the grounds. Letting this mixture sit for 10-15 seconds will help the coffee taste less bitter and acidic! Other pourover techniques that help with an AeroPress include pre-wetting the filter to remove the papery taste an pouring in a circular motion to evenly saturate the grounds. Another technique you can look to is inverted brewing! To use this method you'll want to grind fine, using a 1:16 ratio of coffee to water. Flip the AeroPress upside down and push the tip of the plunger into the press. Add coffee and water as normal and stir. Next, let the coffee brew for one minute. Place a wetted filter in the cap, and put the cap on top of the AeroPress. Next, put your coffee cup on top of the AeroPress, then carefully flip the entire press and cup over and plunge as normal. This method results in a rich brew that, with proper plunging, comes out free of grit or sediment. One surprising thing to note about the AeroPress is that lower temperatures can work better than the typical brewing temps you may be used to. By brewing in the 175-185 degrees Fahrenheit range you can get better coffee than more typical, hotter temps. Try both ends of that range and see which one works better with different beans! Another thing many users don't consider is pressure variation. The rate at which you plunge affects the pressure that the coffee is brewed with. A harder, faster press will result in a heavier body. While not an exact comparison to espresso, it's the same principle as that brew method. on the flip-side, for a lighter cup, a slower, gentler press will result in less body and a lighter taste. Speaking of pressure, if using the standard non-inverted method, you can insert the plunger to use back-pressure to stop the drip that happens when you add water to the coffee grounds. this will prevent any weaker coffee from dripping out. One other practice to try is brewing AeroPress coffee as concentrate. Even at a standard 1:16 coffee:water ratio, this device brews some pretty strong coffee. If that alone is too strong for you, cutting it with water helps for a lighter cup. Another thing to consider is to brew with less water, creating a thicker concentrate. From there, you could store the concentrate in the fridge for an iced coffee, or just add hot water straight away to make more servings. All of these ideas an more are down to experimentation. One of the best parts about the AeroPress is how variable it is. Let us know if you come up with any other fun tricks! This entry was posted in Articles, Coffee Makers, Gear Guides, Educational on April 23, 2019 by Pat Cotter. Coffee Culture Around the World: Coffee and Beer! Coffee Culture Around the World is our series on the ways coffee impacts people and industries all over the planet! Coffee and beer have a lot more in common than you might think, even without the growing popularity of coffee notes in craft beer. Similar to micro-roasters, craft brewers are constantly taking on massive, global brewers that dwarf them in market share and production. Also like roasting, people are incredibly passionate about the beer they drink and the people that produce it. Additionally, while brewing and roasting may differ greatly in process, brewers and roasters share another commonality: Distance from farmers. It's rare that a brewer has access to the hop farmers that provide the basic ingredients to their products. Roasters have a similar difficulty, being unable to see beans from planting through processing. Finally, stouts and porters tend to have notes of coffee in them even without the addition of grounds. This is due to the longer roasting time of the grains present in beer. It makes sense then, that craft breweries and micro roasters might be able to work together so easily. The first consideration a brewer must make when setting out to make a coffee beer is selecting a roast. While single origins may be delicious, typically brewers need something produceable on a larger scale. On top of this, variations in the flavor of the roast can impact the balancing act of notes in the beer, so consistency is key. This is why brewers tend to go for roasts that are produced in larger quantity, and that are available year-round. Since the coffee is going direct from bag to brew, they will usually purchase it ground as well. To add coffee to beer most brewers use a cold brewing method. Often, water is combined with the coffee in a traditional cold brew to extract the flavor from the grounds. In other cases, grounds are added directly to the beer early in the brewing process, then cold-pressed out. Occasionally, whole beans are even used instead of grounds. These infusion methods change the intensity and aroma of the beer considerably, so brewers tend to tweak methods of adding grounds extensively before settling. On top of this, every roaster has to adapt to changing economic conditions of their suppliers, so roasts tend to change over time as well. This leads to constant tweaking in the brew, making coffee based beers one of the most complex to keep consistent. As you can see, a lot more goes into brewing a great coffee beer than dumping some mass produced grounds into the tank. Brewers and roasters work closely to combine their products, and the results are even more tasty and complex than each beverage on their own. This entry was posted in Articles on May 24, 2018 by Pat Cotter. Welcome to Gear of the month, our monthly series on coffee hardware. These are pieces of coffee tech that we really love, that we've used a lot in the past month. While not always new, they’re great, and we want to show them to you! This month’s gear of the month is the Stagg EKG+, from Fellow. The EKG+ is the new update to the existing EKG, and it may never leave our pourover counter. Winner of the 2018 Red Dot Design Award, The Stagg EKG+ is a phenomenal new electric kettle from Fellow. It offers an iOS app, Acaia integration, and frankly stunning ergonomics and aesthetics. Overall this kettle is about as loaded with features as is possible for a simple piece of hardware. Though for $200, it better be. Before we dive into the connected features of this device, is it good at it’s most important function? Short answer: Yes. Long answer: Definitely yes. The design of the Stagg EKG+ is about more than just looks. You may scoff at the idea of a nuanced kettle, but we think this one may change your mind. The EKG+’s design ergonomically distributes weight where you want it, and the handles makes flow control from the spout very easy. Even the shakiest of hands should be able to get the perfect pour rate out of this kettle, whether it’s full or nearly empty. Beyond solid control, it just feels great in your hand. If we have any complaints about the build at all we would say that the lid could be a touch easier to remove. That said, it’s not something we'd knock the kettle for in the end, and it's comparable to other models. Maybe even more impressive than the usability of the EKG+ is how elegantly Fellow managed to pair ergonomics with aesthetics. This kettle is a thing of beauty, in fact, we feel like we need an entire kitchen renovation to do it justice. The Bold lines of the pot married to a striking handle design and satisfying curve to the spout leave a serious impression. That’s saying something for a piece of hardware that is normally quite utilitarian. But the aesthetics and feel of the EKG+ are virtually identical to it’s older brother, the EKG. Minor differences in texture and coloring are present, but that alone wouldn’t be enough for us to be excited about a $200 kettle. The plus adds connected features that really make it worth the extra price if you don’t already own an EKG. The first of these features is the Fellow EKG+ App, which allows you to set temp and control on/off functions remotely. The app also tells you if the kettle is off of the base. This is a basic but awesome feature for those prone to misplacing gear (like we can be sometimes). It’s simple, but we enjoyed being able to control and monitor temperature from our desks. The downside is that this app is only currently available on iOS, and there's no timeline on and Android release. Even more exciting is the way that the EKG+ integrates with Acaia’s Brewbar app. We’ll do a more in depth feature on Brewbar down the road, but if you’re already using it, the EKG+’s integration might be the most exciting thing about it. Brewbar allows you to save every single parameter that goes into your pourover recipes. Things like temp, grind, weight, and flow rate. The app can store your temp data and set those parameters on the kettle with a touch of a button. It’s a very useful feature if you brew a lot of pourover, because it easily automates a prep step. Again, the rub here is that the app is only available on iPad. We're not aware of any plans for it to hit other devices. At the end of the day, we feel the tweaks to the EKG+’s appearance and added connected features justify the increase in price. With that said, $200 is a lot for a kettle, and existing EKG owners may find the upgrade cost to be a tough pill to swallow. If Brewbar is intriguing to you and you’re already working with Acaia products, we think it’s a much easier sell. If you're interested in purchasing the EKG+, check it out here! Thanks, and remember to make coffee you love! This entry was posted in Accessories, Articles, Gear Guides and tagged Stagg, EKG, Kettle, Pourover, Brewbar, Fellow on May 17, 2018 by Pat Cotter. Olympia Coffee Roasting Co. has long been a Seattle Coffee Gear favorite amongst the roasters featured on our website and in our subscription service, supplying our customers with dynamic single-origin offerings and fantastic blends. Beyond just their delicious coffee, the company has challenged themselves to provide the best working conditions and wages possible to all people involved in the creation of their product through a new program called Fair For All. We met with Olympia Coffee's Director of Sales, Honor Forte, to chat more about Fair For All and how it will affect those involved in the farming and processing of their coffees, as well as what customers can expect with the implementation of the program! Thanks for sitting down today, Honor. Can you share what you do for Olympia Coffee Roasters? I am Director of Sales for the company, so I help any of our wholesale partners. Anybody that’s not our coffee shops that serves our coffee, I help them through onboarding and getting connected with training. I do consulting to help people build their bars efficiently, using the experience from our own four coffee shops—soon to be five. I do outside sales. So, finding new clients and directing inquiries to become partners. And I also do daily marketing. Not so much our big marketing plans, but I do our Instagram posts or interact with magazines or publications that maybe need photos of us or whatever else. I studied photography and printmaking—that’s what my degree is in. I just love photography and want to do that, so I basically do that because I love talking about the brand of Olympia Coffee and I love taking photos. It puts a creative element into my daily life, which I like. So, you went to school for Photography and Printmaking. Where did coffee come in to play? I went to Philadelphia after going to school in West Virginia and started working at a place called Ultimo Coffee that served Counter Culture at the time. I learned a lot really fast and realized I wanted to work for a roaster, someone that was sourcing green coffee in a Direct Trade model. That was really appealing to me. At the time I thought, “Direct Trade is the name of the game in coffee right now. Who’s doing it?” That brought me to a point where I became aware of Olympia Coffee and what sort of things they were trying to pioneer in Direct Trade. When I was looking at where I wanted to go work, Olympia had just been bought by two of its employees—Sam and Oliver, the owners. They were moving towards a 100% Direct Trade model. Their goal was to get to a place where every single coffee they sourced was Direct Trade. They were in a small, appealing town. They had a lot of things going for them. I also really liked that it was baristas who bought the company, managed by people who came from the bottom of the company, up. I moved out to Olympia in 2011 and started as a barista, moved into delivery driving and sales, and now I’m Director of Sales seven years later. You talked about Direct Trade. Olympia is introducing a Direct Trade requirement called “Fair For All.” What exactly is that, especially for those who may just think of it as Fair Trade? That’s one of the first things we talked about: is this just going to evoke images of Fair Trade? We think the answer to that is yes, and that’s good. Customers are so familiar with it and think so highly of it, we think it’s okay for people to think about that. Let’s talk about Direct Trade. It’s this awesome thing that happened in the industry as we moved away from this idea of working with huge co-ops and having coffees blended together. Fair Trade was a response to unfair values, slave labor, and people being taken advantage of at farm levels. But Fair Trade has always been limited to co-ops, big groups of people, and also has set values. There aren’t necessarily scales that depend on how high the quality of the coffee is. Direct Trade is a response to that. It’s awesome. What Olympia Coffee has been doing for the last seven years is building relationships to create new coffees at the farm level and pay prices appropriate to the quality level of that coffee. That’s resulted in us paying more that double Fair Trade prices to all of our coffee farmers. We crossed a point in 2016 where one hundred percent of our coffees, including our decaf, were Direct Trade. That’s where every single coffee in our lineup is built from the ground up, with the coffee farmer, paid at more than double Fair Trade price, and with continued partnerships existing around those coffees. We return year after year to build new coffees or new systems in place to make that relationship better with the farmer. If you would’ve asked me two years ago—this is the dream. You know people aren’t being taken advantage of and farmers have an opportunity to grow a better quality of life through working with our company. They have incentives to want to increase the quality of their coffee to make more money. Oliver, our green coffee buyer, started to see a breakdown into who was still left out of this story. That’s what Fair For All answers. Fair For All is our commitment to work not just with coffee farmers, but also with laborers. This includes coffee pickers, coffee processors—any hand that has a role in creating one of our products. We want to make sure that those people are making sustainable wages. A really easy to understand example is that a Geisha can go for more than $50 per pound as opposed to a more traditional coffee at $2-4 per pound. But the people who actually picked that Geisha varietal might be making a less than sustainable wage at the farm. So, we’ve always incentivized farmers, farm owners, and co-ops wards to create higher quality coffee. But we’ve really left a whole group of people out of the story as an industry. So Fair For All is us creating written and verbal agreements depending on the culture and the location where we say we aren’t going to purchase coffees where people were taken advantage of in any part of the creation of that product. How is the quality control maintained when these farms are all over the world? We’ve already visited our coffee farmers for years. Since 2016, one of our standards of Direct Trade is that we visit each of our farmers at least once a year. So we’re already aware and in contact with those farmers. We will now guarantee a sustainable minimum wage to all laborers involved in the production of our coffees (pickers, processors, and farm workers), set seasonally with the farm owner or cooperative board. The thing that makes this possible, I think, is a lot of our exporting partners—people like Caravela in Colombia—are on the ground there to uphold the things we are requiring. They’re the ones that are there all year round saying, “Olympia Coffee wants to pay this amount of money if the people you hire are paid this amount. Can you agree to that?” They are basically upholding our vision. It takes a lot of infrastructure worldwide to be able to do these things. But we’re at a point now where we know all of our partners, and the seven countries we work in regularly (nine we’ve worked in during the last year), have these processes in place to ensure these systems move forward. We can say a coffee is Fair For All and know that is true. The other thing that I haven’t said is that we will only work with farmers who provide safe working conditions free of unnecessary danger, oppression, and violence and with access to clean water and healthy food. How has it been received by the people you’re working with? A thing worth clarifying is that we started this essentially last year. We didn’t have the term Fair For All nor did we know how to communicate it with the public, but we’re already in the middle of releasing a lot of coffees that are Fair For All. They already meet these standards because these things have already been in place. Especially in places like Colombia where there is a ton of infrastructure and traceability. It’s just a matter of really communicating our goals and what we’re looking for in places like Kenya or Ethiopia, where we are working with really big groups of people and co-ops. They are a little bit harder to trace what’s happening and I’m guessing that Kenya and Ethiopia will be some of the last coffees to go Fair For All in our program since we’re not working with as many small, individual farms. I think it’s going to be more complicated than it is “hard.” People aren’t responding badly to it, because once again we pay more than double the Fair Trade price for our cheapest coffees. We’re interested in really incentivizing these things so that no one feels like they are being taken advantage of. It’s not just another regulation. We want to pay appropriately for these coffees. I feel like I’m constantly seeing Olympia Coffee being recognized in different publications. You guys were just on National Geographic’s website, you’ve been all over Sprudge. It really shows that all of the effort that you guys are putting in to your programs is worthwhile, but that’s been happening for years. I guess a question that I have is why? Why add this next step, especially as you guys continue to scale larger? What drives you to want integrate a program like this that could be seen as more challenging? That’s a great question. You know—we always view ourselves as a quality of life company. Anytime we’re asking “Should we do this? Should we do that?” in any sort of planning meetings, we’re always talking about quality of life for farmers, staff, and customers. I’ve found it to be true that Olympia Coffee’s ownership, management, sales team, anyone onboard really—the decisions we make to exist the way we do come down to better quality of life for all people involved. So I really think that this is just another way that we can move forward in improving the quality of life for more people with our products. And that’s really cool to me. Beyond the official word, honestly I think Oliver and Sam (the owners of Olympia Coffee) really just want to create a better world and want to look at their company and know that they are making decisions that are really good for the people around them. We are ultimately a corporation that exists to thrive. We have to make money. We’re a business. But all wrapped up in that is the desire to really benefit the people that we work with. I’m convinced of that more and more. I’ve been with Olympia Coffee for almost seven years. The whole time I’ve been there, when I see Oliver and Sam presented with questions about where Olympia should invest itself to better specific things at the farm level, I’m always really proud of the decision that are made. Even if it costs us more. Even if it costs us profits. All I can say is that I really think they want their company to be something they’re proud of. Totally. What kind of changes will customers see? Will prices increase? They are going to see labels on our bags that say “Fair For All” instead of Direct Trade. We’ve decided to move away from using the phrase “Direct Trade” just to simplify it and give people one thing that they can trust and know exactly what it means. Fair For All encapsulates everything that we want to be. Our goal is that every single coffee that we offer will fall under the Fair For All program. I don’t think prices are going to increase. This is really a system of verifying what has already been happening at a lot of our coffee farms versus adding a new price level. What you’re going to have as a customer is more traceability and clarity on what you’re buying rather than a higher price. Right on. What exciting coffees are coming down the pipeline that people can expect to see soon? Our very first Fair For All coffee was roasted on January 22nd. That coffee is called Colombia Aldemar Rodriguez. It is a micro lot from a single producer in Colombia. It’s very traceable already, so we’re able to have it meet our Fair For All standards because we know this person. Aldemar has created coffee specifically for Olympia Coffee and his micro lot is fully traceable by Caravela in Colombia. After that you’re going to see a string of several micro lots in Colombia that all meet our Fair For All standards and are labeled as such. All of them from single producers. All of them scoring more than 90 points on Coffee Review. Beyond that our Colombia San Sebastian Resereva, which is a product we have about 80% of the year, is also meeting Fair For All standards but is not labeled as such yet—because it’s brand new. And then slowly throughout the year, we are going to add that to all of the coffees we can verify. Hopefully within the year you’ll see it in the entirety of our line. Burundis are here too and are also Fair For All from Long Miles Coffee Project. You might see those in coffee competitions through out the year as people often compete with our Burundis. Any other exciting things we should be keeping an eye out for? We have the two shops opening! We just opened our West Seattle location. Our Proctor location in Tacoma should also be opening within the first half of 2018. More info on that on our social media! Thanks for sitting down with us Honor! Purchase coffee from Olympia Coffee Roasting Co. here! This entry was posted in Articles, Coffee & Tea, Roasters, Interviews and tagged direct trade, fair trade, roasters, Olympia Coffee Roasting Co, Interviews, Fair For All, Olympia Coffee on February 8, 2018 by Ben Schuyler. Sleek, modern, and highly programable—it's the Miele CM6150. One of Miele's newest offerings in their line of Swiss-made coffee makers, the CM6150 serves as a relatively affordable entry point into high end superautomatic espresso beverages deliciously prepared. It features a sleek plastic case available in both white and black, simple one-touch drink recipes, and auto-on and off functionality. Perfect for a large family or small office of coffee drinkers who desire options without a headache, the CM6150 will look great in your kitchen or break room without breaking the bank. Worth noting as well is Miele's remarkably effective auto-rinsing as well as the milk siphon tube flush function preventing unappetizing build up anywhere in the machine. When it comes to having options, your possibilities are endless with the CM6150. Easily one of the most programable machines at its price point, Miele's entry-level superautomatic gives you a truly impressive amount of drink options without sacrificing features found on many higher end machines. After comparing the CM6150 with the similarly priced Jura E6, we found the overall quality of the drink to be slightly smoother from the espresso to the milk texture. Moreover, the ability to set your drink to five different temperature settings allows for the user to enjoy their coffee without the fear of it cooling down too quickly (or being too hot for that matter). However, with so many ways to use your Miele, programming the machine may feel like a chore for the first few times of use compared to the E6's straightforward one-touch design. Additionally, the machine lacks Jura's Intelligent Water System, which keeps track and notifies you when your water filter is due to be changed. Nevertheless, we've found Miele's CM6150 tough to beat when it comes to superautomatic machines at this price point. The CM6150 looks great on a counter, can prepare two drinks at a time, and brews a super delicious "pot of coffee" featuring 3-8 cups of Joe! Who will love this machine? Miele's CM6150 is the perfect semiautomatic espresso machine for the large family or small office that appreciates modern design and plenty of options when preparing a drink. It is affordable and easy to clean, so once you get the hang of its many features you'll be on your way to quick and delicious coffee! Purchase the Miele CM6150 here! This entry was posted in Articles, Coffee Makers, Superautomatic, Gear Guides and tagged superautomatic espresso machine, Superautomatic, Gear Guide, CM6150, Miele CM6150 on January 25, 2018 by Ben Schuyler. We know you're well into the new year, but we have an addition to your list of resolutions. MAKE COFFEE YOU LOVE! Delicious coffee at home couldn't be simpler, so we put together a collection of some of our favorite gear essentials to get you on your way! Get on the road to your best brew yet with these items! Why you'll love this Drip Brewer: The name of the game is "simple" with this 2017 drip brewer release from Bonavita. This brewer features a one touch design, easy to use optional pre-infusion, and a consistent brew at the 200° sweet spot. The Metropolitan produces a deliciously clean cup for a brewer coming in at just below $100, which is credited in part to its straight forward unibody plastic case. Why you'll love this Machine: Saeco's new Incanto Plus is a Seattle Coffee Gear exclusive that gives you many of the diverse features of a solid superauto without going too in-depth with overwhelming technology. You'll also enjoy easy drink programmability and panarello wand or automatic cappuccinatore steaming options. The Incanto Plus is accessible not just in it's usability but also with its price. Why you'll love this Grinder: It's 2018 - the year of ditching your blade grinder. While it may sound like an overwhelming investment, you WILL taste the difference. Baratza's line of grinders are accessible at multiple price points including the Encore, Virtuoso, Forte AP, and many more depending on your needs. So why the Vario? It's just about perfect when it comes to grinding anything from espresso to French press. And, with automatic dosing by weight you don't have to worry about wasting excess grounds. Paired with a quiet grind and easy cleanup, the Vario is a total winner. Why you'll love this Kettle: Let's just make one thing clear from the get go—this kettle is FAST. In fact, it is the fastest of all of the kettles we currently carry, heating a liter of water in four minutes. Additionally, the gooseneck design allows for optimal pour over control. With its easy to use temperature dial, built-in timer, and ability to hold your temperature for 30 minutes—this sleek kettle is a must have. Why you'll love this Scale: We've all had that experience of enjoying an incredible cup of coffee that we just can't seem to replicate. While there are many contributing factors going into that cup like differences from roast-to-roast and the quality of the harvest, there are a handful of tools you can use at home to brew a more consistent cup of coffee. Using a scale to measure your coffee as opposed to eyeballing your amounts will do wonders! The Acaia Scale features an LED screen, touch-sensitive buttons, heat resistant pad, and and an interactive app that lets users recreate recipes from the past and experiment with new brews. Why you'll love this Product: All of the gear in the world can't make stale coffee taste good. Whether you go through a pound of coffee in a week or a month, having the proper storage is crucial to a tasty bean! The Airscape's patent-pending valve allows maximum freshness by removing oxygen that causes your beans to grow stale. Available in two sizes, the larger of the two holds about 16oz of whole bean coffee. Pick your color of choice and taste the difference fresher coffee can make! Why you'll love this Machine: Milan-based espresso machine manufacturer Rocket Espresso brings cafe quality coffee to your home at a fairly affordable price with the Appartamento. Featuring Rocket's tried-and-true heat exchange boiler and E61 group head pairing, you'll be pulling shots and pouring lattes in polished style. Featuring a small footprint perfect for those with limited space! Pair this with a solid grinder (maybe the Baratza Vario!) and you'll be enjoying delicious espresso in no time! Why you'll love this Coffee Maker: World travelers—say goodbye to instant coffee. 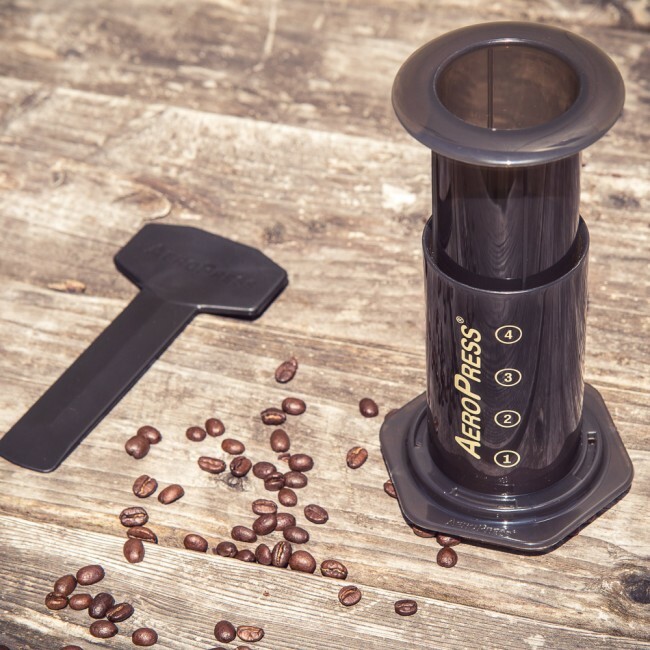 The AeroPress Coffee Maker is here to help you brew a wonderfully smooth and robust cup of coffee from your kitchen, hotel room, or camp spot. Easy to clean and super lightweight, the AeroPress is tough to beat when you're craving a cup of Joe. Whether your traveling with a compact hand grinder or freshly ground beans, you'll be pleasantly surprised by how delicious the coffee coming from this simple brewer can be! Taking your love of coffee to the next level in 2018 doesn't have to be hard! Whether it's this gear or another favorite piece, a little effort goes a long way! Want to share a picture of your essential gear setup? Use the hashtag #makecoffeeyoulove to show everyone what you're working with! This entry was posted in Articles, Coffee Makers, Grinders, Semi-automatic, Superautomatic, Gear Guides and tagged coffee maker, Top 8, 2018, New Years, Gear Guide, Staff Pick, essentials on January 23, 2018 by Ben Schuyler. Parents - they're hard to trust when it comes to gift giving. Sure they mean well, but if you get one more pair of Long Johns and weird argyle socks this Christmas you may just lose your mind (UGH! Stop embarrassing mom and dad!). Keep it to the classics - killer vinyl, a new skateboard, and Madcap's Holiday Fusion! The pinnacle of cool, this delicious Holiday Blend of Kenyan and Guatemalan coffees is best enjoyed while jamming out to your favorite record or in between kick flips in your driveway. We're excited to spend twelve days of the month highlighting delicious coffees coming from roasters near and far. All of which are available in the holiday blends section of our website! Reach for a mug and pour yourself a little holiday cheer with your coffee! Holiday Fusion is 50% Karinga, Kenya and 50% Agua Dulce, Guatemala. The Karinga imparts lots of sweetness and vibrant cranberry acidity and the Agua Dulce adds some nice berry qualities and even more structure, making the cup very full and deep. This coffee is very versatile and can be enjoyed in any brew method. If you are making a pourover, try a 17:1 water to coffee ratio and and shoot for 3-4 minute brew time. If you are making a v60, that time should be closer to 2 1⁄2 - 3 minutes. What is your favorite thing about winter? How quiet the world is with fresh-fallen snow. As always, we will be releasing new and exciting coffees from all over the globe. Some will be old friends as well, but the coffees never get old. We love seeing crops change and improve year after year. Look for us to highlight our partners in new ways and also look out for some very special offerings toward the end of the holiday season and at the new year. Click Here to buy a bag of Holiday Fusion! This entry was posted in Articles, Coffee & Tea, Roasters, Interviews and tagged coffee, christmas, holiday blends, Coffee Love, holiday fusion, madcap, madcap coffee company on December 12, 2017 by Ben Schuyler. Ah the holidays - a time of merriment and glee! Everything feels a bit more sentimental - meals with friends and family, drives through your old hometown, Christmas movies from your childhood. Tidings of comfort and joy abound! With all this good vibes coloring the season - you need a beverage to match! Look no further than Ruby Coffee Roaster's Cheers Holiday Blend. It's the perfect seasonal offering to fill your mug with and clink to a healthy and prosperous 2018! We look forward to working on Cheers every year and the fourth time around was no different. This year we decided to start with a microlot from Finca de Dios in Fraijanes, Guatemala, which has a nice cakey sweetness and some soft fruits that fit right into our vision. We paired that with Kenya Gachatha and Ethiopia Yabitu Koba to add some wineiness to the cup and take the roast just deep enough to coax out some spice notes. We’ve been brewing it on the Kalita Wave with 32g ground medium-coarse, 500g filtered water, lasting 3:30-4:00. It also makes a seriously decadent French press. Try a 1:16.5 ratio (grounds to water), steeped with very little turbulence for 10+ minutes and make sure to skim the brown muck from the top after breaking the crust. Enjoy with cherished family and friends. Cheers! Gift-wrap or gift bags? Wrap, obviously. Bows or curly ribbon? Curly ribbons if moms are the ones wrapping. Steady lights or twinkling? Twinkling, as long as they’re not flashing. A gentle twinkle is magic. Angel or star tree-topper? Classic star. No questions. Real tree or artificial? Only real trees in rural Wisconsin. Cut ‘em ourselves then burn in February. Long needles or short? Whichever is less prickly. Plenty of tasty coffee! We’ll be continuing to work with many of the same talented and dedicated producers that we worked with this year and in years past. We’re particularly excited for the coffees we have arriving very soon from Burundi--some of the most remarkable and intriguing lots we’ve tasted! We’re also working on a website redesign, which will create a nicer experience and add functionality that’ll help us serve our customers better. Click here to buy Ruby Coffee Roaster's Cheers Holiday Blend! This entry was posted in Articles, Coffee & Tea, Roasters, Interviews on December 11, 2017 by Ben Schuyler. It's winter time. And sure, it's beautiful what with the changing weather and such. But as the weather worsens, that every present fear of getting stuck inside looms - cabin fever. Breaking free might feel like your only solution - but may we offer an alternate option? Espresso Republic's Cabin Fever Blend! Forego the maddening flee from the indoors and embrace the warm comfort of the cabin with this delicious holiday blend! A phenomenal fall and winter blend from Costa Rica & Guatemala featuring notes of milk chocolate, caramel, and warm spices. It is best served with a Chemed to share with loved ones or even a French press for those who enjoy a fuller body in cooler weather; in a cabin high up in the mountains; wrapped in fleece blankets. Who needs hot cocoa? 1:14.8 (48g coffee : 710g water) Water to coffee ratio is our ideal! Eggnog or Hot Chocolate? Who needs eggnog when you can spike hot chocolate! The return of our seasonal espresso for the spring time: The Illumination Espresso featuring notes of stone fruit, citrus, and vanilla bean! Click Here to buy Espresso Republic's Cabin Fever Blend! This entry was posted in Articles, Coffee & Tea, Roasters, Interviews and tagged interview, Roaster Feature, holiday blends, Coffee Love, cabin fever, espresso republic on December 10, 2017 by Ben Schuyler. There's no doubt about it, the holidays can be a stressful time. Get anybody in a room together who have their own differing perspectives and opinions and the possibility of a Christmas themed cage match increase exponentially. Don't let the coffee you serve divide your family! Our friends from Huckleberry Roaster in Denver, CO have taken it upon themselves to craft the perfect uniting holiday blend - Sister Winter. Drop the sibling rivalries and embrace the love over a cup of tasty brew! Our annual Sister Winter Holiday Blend gets released as the temperatures begin to drop, the sun fades away earlier and the desire to hunker down with family & friends takes over our souls. Since we hope Sister Winter is shared and enjoyed by the whole family, we roast & blend it intentionally to be a crowd pleaser -- something that a grumpy uncle recovering from too much mulled wine the previous and your 22 year cousin with a brand new barista job can bond over, and enjoy together. Sister Winter is a blend of two of our favorite coffees from Guatemala (Dona Lucinda from Lake Atitlan) and Ethiopia (a natural processed coffee from Guji, Sidama). It tastes of sweet chocolate, a little sweet & spice and an underlying layer of fruitcake - but the kind of fruitcake that you actually want to eat. What is your favorite holiday treat? I'm a Dutch kid (Hup, Holland, Hup! ), so I'm partial to these amazing winter/holiday treats called Oliebollen, which are sort of like Dutch donuts, but translates to "fried balls of dough with powdered sugar". I'll allow you to wipe of the drool now. What are your thoughts on Pumpkin spice? I don't do it often, but when i do it's spectacular. btw, what did pumpkin spice do to deserve all the hate it gets?! Favorite winter activity? Play in snow with my family and then reward ourselves make boozy warm drinks (for the adults, not the kids!). Favorite Holiday scent? If i could live semi-permanent fog of mulled wine aroma's, i'd be happy. and probably a little tipsy. DAIRY BLOCK! New cafe alert! New cafe alert! It's going to big, it's going to be radical, it's going to be delicious! Come visit us in downtown Denver! Click here to buy Huckleberry Roaster's Sister Winter! This entry was posted in Articles, Coffee & Tea, Roasters, Interviews and tagged coffee, huckleberry roasters, holiday blends, Coffee Love, Sister Winter, Coffee Time on December 9, 2017 by Ben Schuyler.